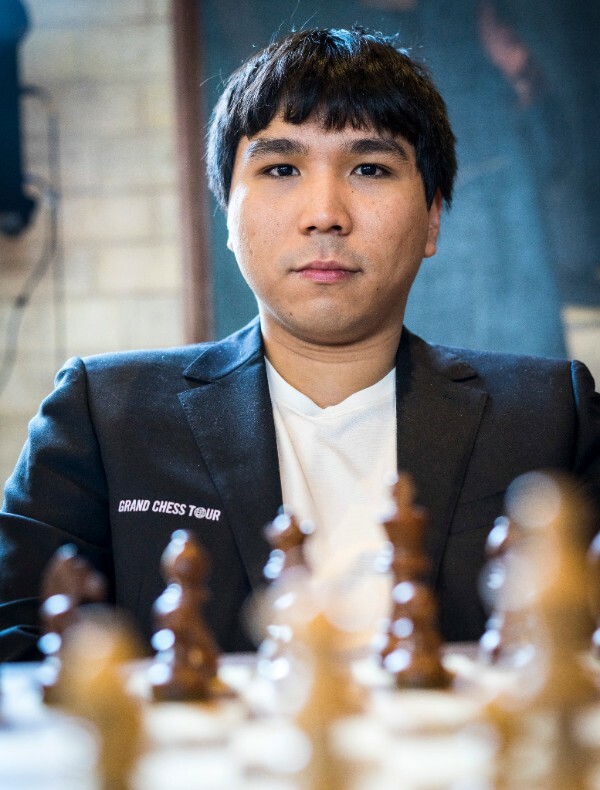 Wesley So emerged as the winner of the rapid portion of Your Next Move Grand Chess Tour. He is now headed to the blitz portion with a two point lead over the rest of the field. In the blitz, each win is worth one point, so his competitors are two wins away from catching him. 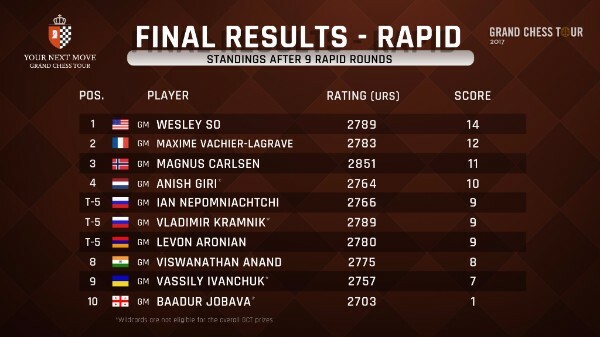 He finished first under the watchful eyes of Maxime Vachier-Lagrave who was always a striking distance away from and finished in second place. World Champion Magnus Carlsen had a very shaky day and has to settle for third place. It is interesting to note that the top three finishers all participated in the first leg in Paris. As it was the case in Paris, the weekend of blitz will determine the winner of the second leg of the tour, as the tournament is still wide open. This was the most peaceful round thus far. Tournament leader Wesley So drew his game against Ian Nepomniachtchi, when the Russian missed the opportunity to win a pawn. 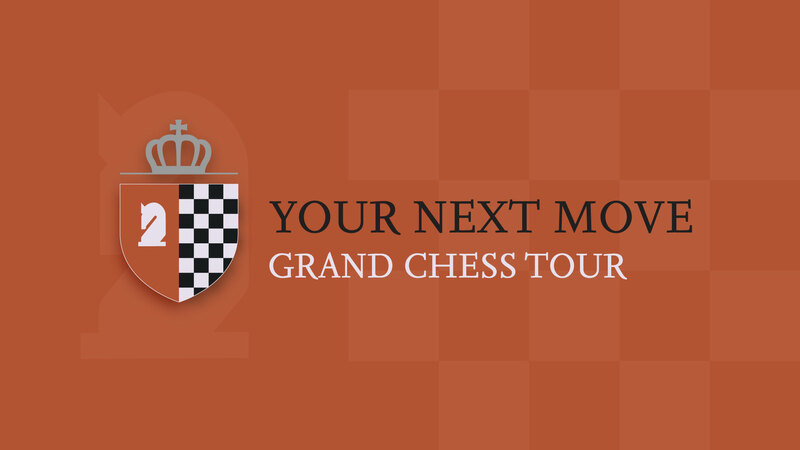 Anish Giri vs Magnus Carlsen and Levon Aronian vs Vassily Ivanchuk were both quiet draws. 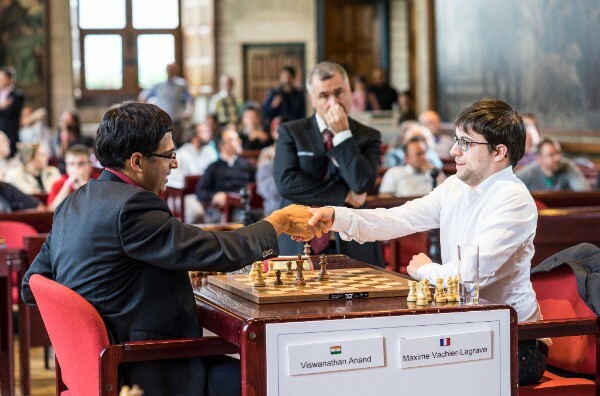 Viswanathan Anand played a brilliant game against Maxime Vachier-Lagrave but the frustration from not finding a final blow to seal the deal got the best of him as he not only gave away his advantage, but actually lost the game. This win allowed the Frenchman to leapfrog Magnus Carlsen and take over a clear second place, only one point behind So. Vladimir Kramnik’s two rooks overwhelmed the exposed queen of Baadur Jobava, who is still looking to score a point. Vachier-Lagrave was on the white side of the Sicilian this time and won an imbalanced attacking game against Ian Nepomniachtchi. Wesley So needed to win to keep his lead. 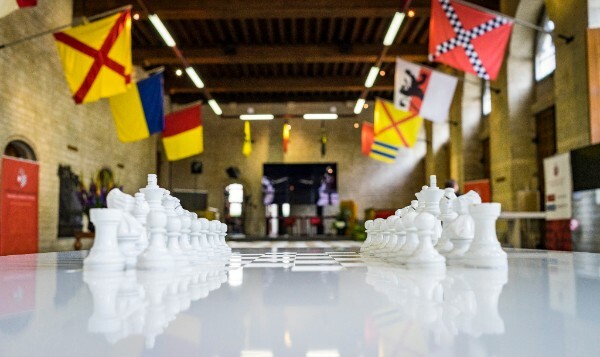 He was up to the task as his bishop pair overwhelmed Aronian’s position and he won in the endgame where he had a rook, a bishop and several pawns for the queen. Vassily Ivanchuk also was not successful with the Sicilian as Kramnik’s attack allowed him to go into a superior endgame, which he converted without any problems. Magnus Carlsen suffered a setback by drawing Viswanathan Anand. 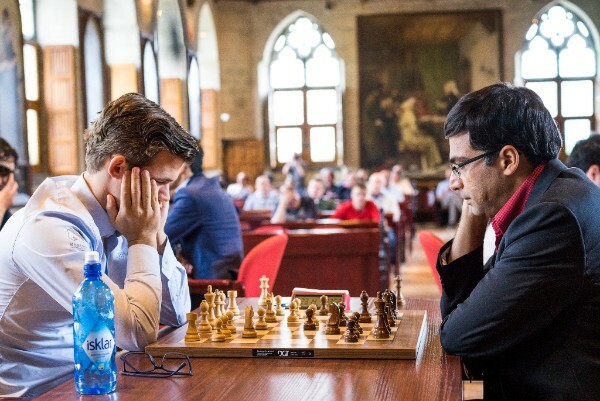 The World Champion played energetically by sacrificing a piece to initiate his attack, but due to his tenacious defense, Anand was able to save the game and even had winning chances. Baadur Jobava was finally able to stop the bleeding and drew Anish Giri. Wesley So drew his game against Vassily Ivanchuk quickly putting the pressure on Vachier-Lagrave to win his game against Levon Aronian. Unfortunately for him, he was already in a losing position down the exchange and So’s result wouldn’t have a big impact on his result. This was the last game to finish and even Garry Kasparov was in the studio sharing his thoughts with Maurice Ashley. He was surprised how long it was taking Aronian to convert who only had twenty seconds left on his clock as opposed to his opponent’s seven minutes and was struggling to breakthrough. Vachier-Lagrave played too fast, probably not wanting to allow Aronian to think on his time and blundered one of his bishops. He had no choice to resign and settle for second place. Viswanathan Anand was facing Baadur Jobava and once again played the first half of the game well, but started to let the advantage slip away. His precise calculation in the endgame allowed him to bring the point home. Ian Nepomniachtchi versus Magnus Carlsen and Giri versus Kramnik ended in a draw.